Mark Webber has branded the reprimand he was given for hitching a ride on Fernando Alonso’s Ferrari after the Singapore Grand Prix night race ‘comical’ in the light of the fact that one of the stewards on the night also hitched a lift during his own F1 career. The reprimands for the Red Bull driver and Alonso have been a talking point since Sunday with Webber also collecting a 10 place grid penalty on the starting grid for next week’s Korean Grand Prix because of two previous offences. Webber told his 765 000 followers on Twitter on Tuesday that for the pair “to receive reprimands for our actions after the race it is comical to say the least. Great moment, and fans loved it. The Australian had retired on the last lap at the Marina Bay street circuit after his car ran out of water and the engine caught fire. He then ran back on the floodlit track to wave down Alonso’s Ferrari, which other cars had to weave to avoid, on the slowing down lap and rode back to the pits on it. Mercedes’ Lewis Hamilton, one of those who took avoiding action, said afterwards that he had been shocked when he came around the corner. “If Mark had been walking across where I went then I would have run him over,” said the 2008 World Champion. Britain’s Derek Warwick, a former grand prix racer who was one of the stewards in Singapore, said the reprimands were fully justified because of the potential danger posed. “It is not health and safety gone mad,” he told the Daily Telegraph. “A driver could easily have been hurt. I hope we’re not seen as killjoys. “I want Formula 1 to be entertaining. I want it to be a spectacle. I’m a big fan of MotoGP and I wish we in Formula One could get closer to the drivers like they do in MotoGP,” added the British Racing Drivers’ Club president. 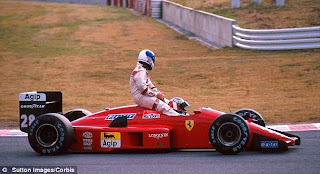 Webber posted a picture on Twitter of Warwick hitching a ride on the back of Austrian Gerhard Berger’s Ferrari at the 1988 Japanese Grand Prix as well as other photographs of similar incidents over the years.